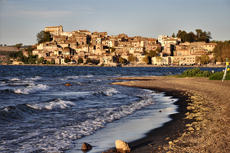 Visit the remarkable Lake Bracciano, also home to the well-known Castello Odescalchi in Rome. Because the use of motorboats is prohibited, the lake one of the cleanest in all of Italy. So come and take a dip, and enjoy! This would have been a two- or three-star, but the wine tasting at the end turned out to be a lot of fun with some great camaraderie. No one wanted to leave. Complete was of time & money. Complete was of time & money. Avoid! 4 hour tour, transferring from Rome to the CIVITAVECCHIA criuise port. Nice tour if you have already seen Rome. Nice tour if you have already seen Rome. Very relaxing ending up with a wine tasting. Lots of wine to drink. Pretty town on the Lake. We didn’t take the long trip into Rome, and took the Lake Bracciano and Wine Tasting excursion. Unfortunately this excursion was cancelled only the evening before which was very disappointing. Unfortunately this excursion was cancelled only the evening before which was very disappointing. Having been to Rome several times before we wanted to experience some Tuscan countryside. Beautiful place. Peaceful, time to reflect. We had seen Rome recently so we wanted to get into the hinterlands. For those who have seen Rome multiple times, go to Lake Bracciano.